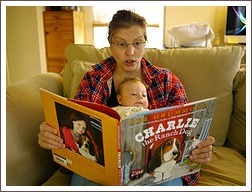 Teach Your Baby To Read - Is It Really Possible To Teach A Baby To Read? Can You Really Teach Your Baby to Read? Google ‘teach your baby to read’ or 'your baby can read' and you’ll get hundreds of responses, most of them trying to sell you some kind of reading program or kit. Unfortunately these programs mislead thousands of parents into needlessly parting with hundreds of dollars in the hope of giving their children a head start in literacy. So is it really possible for you to teach your baby to read? The truth is that a baby simply cannot learn to read as we understand reading. This is because babies do not have the cognitive skills to understand that a word on a page – the word ‘car’, for example - stands for or represents the thing itself – a car. Their brains have simply not developed to the point where they can make a connection between the two. In psychologist-speak, babies under the age of about two have little or no competence in representing the environment using images, language, or symbols. Without this skill, a young child can learn to recognize the shape of a word and to say the word when prompted by a parent but the child is not truly reading because he does not understand what he is saying. He does not understand that those marks on the card or piece of paper Mum is holding up have meaning – that they are actually a symbol for something else. What Are The ‘Teach Your Baby To Read’ Programs? programs designed to be done at home, where you buy a book and make flash cards to use with your baby. Or you buy the flash cards, along with a series of DVDs. programs which involve taking your child (usually aged 2-3 years) to some kind of ‘early learning centre’ which promises to give him or her a head start in literacy. 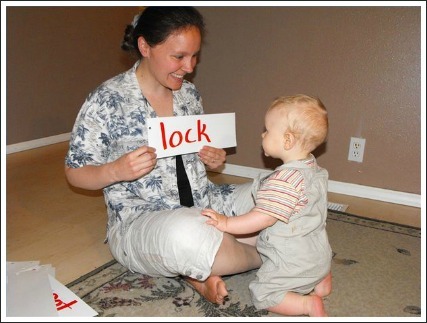 Both types of programs use lots of jargon designed to make you think an ‘expert’ can help you teach your baby to read. an early learning centre for 0 – 5 year olds which offers a program designed to ‘develop language and literacy skills’. a ‘research based’ program for pre-schoolers offering ‘carefully sequenced’ activities designed to develop early reading and literacy skills. (This particular program is run by a speech pathologist and a school teacher). Don't be fooled by all this expert-speak! But Surely the Programs Work? The programs say they will help you ‘teach your baby to read’ but, as we've seen, it's not actually possible to teach a baby to read. What these programs are really doing is selling you a structured way of laying the groundwork when your child is a baby for him to learn to read when he is older. The programs probably do work in the majority of cases because they are based around the same activities many parents do with their children at home as a matter of course. Doing these activities as part of a structured program probably won’t do any harm, provided you don’t push your child. By all means, buy one of the programs if you don’t mind spending the money. But if you can’t afford one of these programs or you simply don’t like the idea, don’t feel your child will be missing out. He won’t be. You can do the same things with your baby without buying expensive books and DVDs and without following a structured programme. What About All Those Testimonials? If you read he book reviews or watch some of the testimonials on the websites you’ll hear some amazing stories about babies who learned to read at an early age using one or another of the 'teach your baby to read programs'. But read or listen carefully because none of the stories are really about babies learning to read. All the stories I’ve read or watched online are about children of about 18 months of age or older recognising words by sight, whether on a TV screen, in a book or on a card. Now, this is a wonderful thing but it’s really not that unusual. My own children (and many other children I know) could recognise and understand dozens, possibly hundreds, of written words before the age of two. At this age (18 months to 2 years) children start to understand and use symbols so they are able to connect a word with the thing it represents. They don’t need any kind of program to learn this. It will happen naturally if their parents simply read to them, play with them and take them places so they get to experience the world around them. The thing is, the parents who rave about the early learning programs or early literacy classes usually have nothing to compare with. They don’t know that they could have achieved the same result simply by reading to their child. It is simple. It’s also cheap (free if you get your books from the library) and fun! There are a few things to remember, though. have fun, don’t stress and don’t try to actively teach your child to read! Is There Proof That Reading Aloud Works? Some of the best stories I’ve read about the power and magic of reading aloud come from Mem Fox and Jim Trelease, two passionate advocates for reading to children. In her book Reading Magic, Australian author and literacy expert Mem Fox tells the story of how her daughter came home from school at the age of four, having been at school for two weeks, bubbling with excitement at being able to read. Mem’s story struck a chord with me because I had an identical experience with my daughter who started school in February 2003 at the age of 4 years and 2 months. Jim Trelease, in his book, The Read-Aloud Handbook, tells the story of Erin Hassett whose mother started reading aloud to her on the day she was born. Jim also tells the stories of two babies, Cushla and Jennifer, who were born with special needs. Both girls had intellectual delays and both had parents who read to them with astounding results. Both Jim’s book and Mem’s book are well worth reading. It's only my opinion but I really think the people who sell programs promising to teach your baby to read are preying on the insecurities we all have when we become parents. Our lack of confidence in our abilities as parents often leads us to look to ‘experts’ to tell us what to do. This allows companies to commercialize the simple, fun activities most parents do with their babies as a matter of course. These activities – reading, talking and having fun together – are packaged up with a whole lot of academic and technical terms into a program to be sold to parents. Part of the attraction for parents of the ‘teach your baby to read’ packaging is that the programs provide some sort of way for parents to measure their child’s success. But if you read to your child and pay attention to your child’s responses, you’ll have the same ‘success’ without the price tag.